A colourful cocktail stick inarguably go hand in hand. So high five low five a try for your special evening of fun. 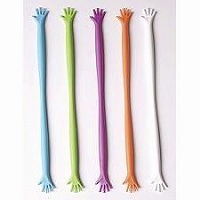 Thrill your guests with this groovy cocktail stick - grab a hand, stick it in your drink and let high five low five do the rest. Your guest will surely be giving you a double thumbs up for originality.